Leakage remains a huge water industry challenge. Water pipe leakage made headlines throughout 2017 ranging from drought fears, regulatory fines, satellites and divining rods! 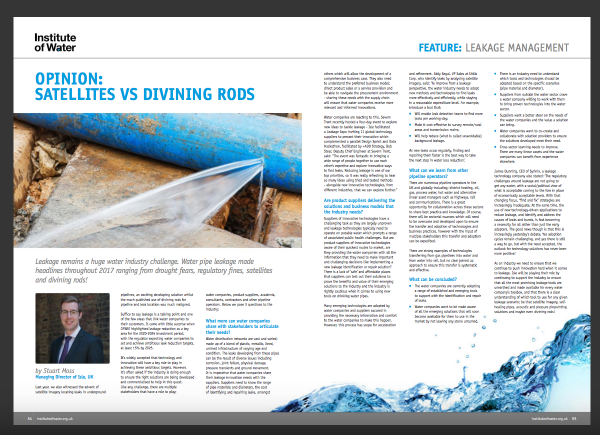 Last year, we also witnessed the advent of satellite imagerylocating leaks in underground pipelines, an exciting developing solution whilst the much-published use of divining rods for pipeline and leak location was much maligned. Suffice to say leakage is a talking point and one of the few areas that link water companies to their customers. It came with little surprise when OFWAT highlighted leakage reduction as a key area for the 2020-2025 investment period, with the regulator expecting water companies to set and achieve ambitious leak reduction targets, at least 15% by 2025. It’s widely accepted that technology and innovation will have a key role to play in achieving these ambitious targets. However, it’s often asked if the industry is doing enough to ensure the right solutions are being developed and commercialised to help in this quest. Like any challenge, there are multiple stakeholders that have a role to play; water companies, product suppliers, academia, consultants, contractors and other pipeline operators. What more can water companies share with stakeholders to articulate their needs? Water distribution networks are vast and varied; made up of a blend of plastic, metallic, lined, unlined infrastructure of varying age and condition. The leaks developing from these pipes can be the result of diverse issues including corrosion, joint failure, physical damage, pressure transients and ground movement. It is imperative that water companies share their leakage innovation needs with the suppliers. Suppliers need to know the range of pipe materials and diameters, the cost of identifying and repairing leaks, amongst others which will allow the development of a comprehensive business case. They also need to understand the preferred business model; direct product sales or a service provision and be able to navigate the procurement environment – sharing these needs with the supply chain will ensure that water companies receive more relevant and informed innovations. Are product suppliers delivering the solutions and business models that the industry needs? Suppliers of innovative technologies have a challenging task as they are largely unproven and leakage technologies typically need to operate on potable water which prompts a range of associated public health challenges. But are product suppliers of innovative technologies aware of their quickest routes to market, are they providing the water companies with all the information that they need to make important and challenging decisions like implementing a new leakage identification or repair solution? There is a lack of ‘safe’ and affordable places that suppliers can test out their solutions to prove the benefits and value of their emerging solutions to the industry and the industry is rightly cautious when it comes to using new tools on drinking water pipes. · Will help reduce (what is called unavoidable) background leakage. What can we learn from other pipeline operators? There are numerous pipeline operators in the UK and globally including; district heating, oil, gas, process water, hot water and alternative linear asset managers such as highways, rail and communications. There is a great opportunity for collaboration across these sectors to share best practice and knowledge. Of course, there will be sectorial nuances which will need to be overcome and developed upon to ensure the transfer and adoption of technologies and business practices, however with the input of multiple stakeholders this transfer and adoption can be expedited. There are strong examples of technologies transferring from gas pipelines into water and from water into rail, but no clear joined up approach to ensure this transfer is systematic and effective. · The water companies are currently adopting a range of established and emerging tools to support with the identification and repair of leaks. · Water companies want to be made aware of all the emerging solutions that will soon become available for them to use in the market by not leaving any stone unturned. · There is an industry need to understand which tools and technologies should be adopted based on the specific scenarios (pipe material and diameter). · Suppliers from outside the water sector crave a water company willing to work with them to bring proven technologies into the water sector. · Suppliers want a better steer on the needs of the water companies and the value a solution can bring. · Water companies want to co-create and collaborate with solution providers to ensure the solutions developed meet their need. · Cross sector learning needs to improve. There are many linear assets and the water companies can benefit from experience elsewhere. As an industry we need to ensure that we continue to push innovation hard when it comes to leakage, Isle will be playing their role by continuing to support the industry to ensure that all the most promising leakage tools are unearthed and made available for every water company’s toolbox, and that there is a clear understanding of which tool to use for any given leakage scenario; be that satellite imagery, self-healing pipes, acoustic and pressure pinpointing solutions and maybe even divining rods!